Roasted cherry tomatoes…kind of contradictory isn’t it? Cherry tomatoes are at their peak, perfectly sweet and juicy, in the summer but who wants to turn on their oven for roasting them when it’s 90 degrees outside? Well, I think when it comes to cherry tomatoes, it’s totally worth it. 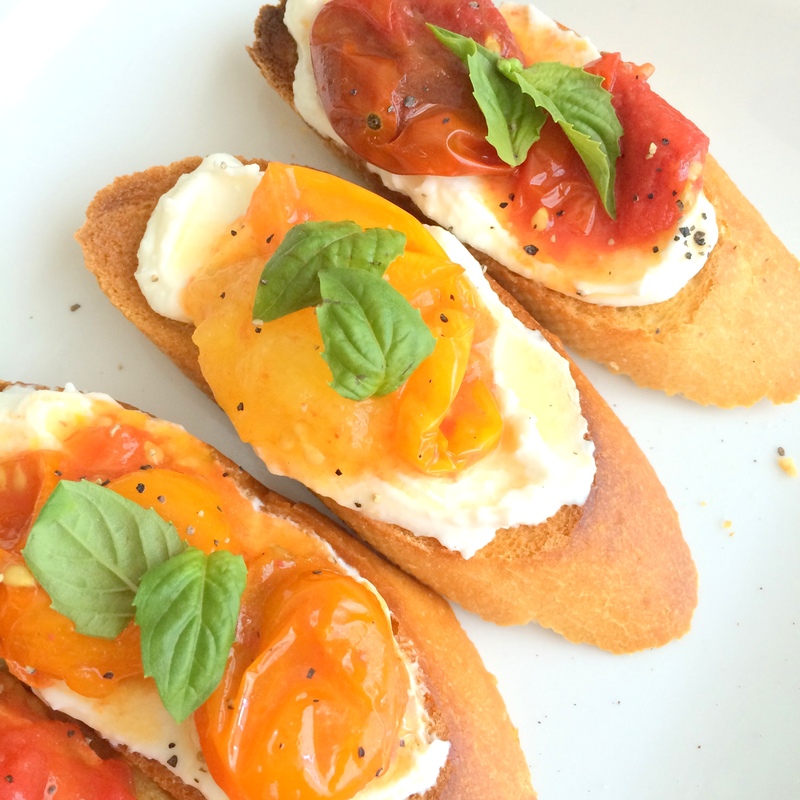 I came across a recipe for a tomato bruschetta that I was excited to make. But when I sat down and read the directions (something I should have learned to do a long time ago), I realized that the whole recipe required a grill (which I don’t have) and that my handy grill pan just wouldn’t do. But since I already had the ingredients, I was determined. So I improvised. 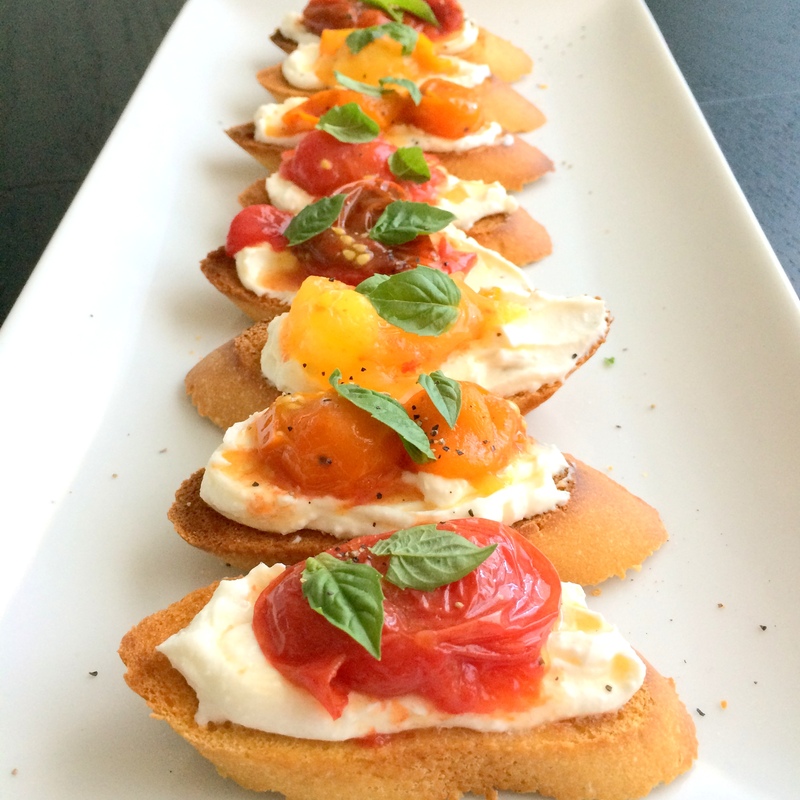 The result is this Roasted Cherry Tomato and Ricotta Bruschetta. Sweet cherry tomatoes are roasted in an oven with nothing but a little olive oil before topping toasted baguette slices and creamy ricotta cheese. A little sprinkle of salt, pepper and basil tops this tasty appetizer which satisfies those summer taste buds. The tomatoes pop with sweetness and blend so well with the creamy ricotta. 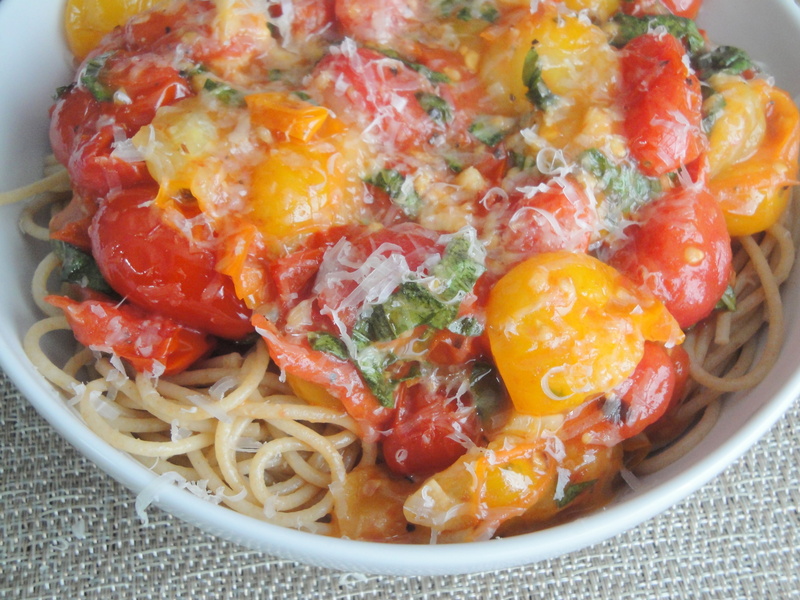 And who doesn’t like basil on top of tomatoes? On toasted bread? I can’t even. Preheat the oven to 400°F. 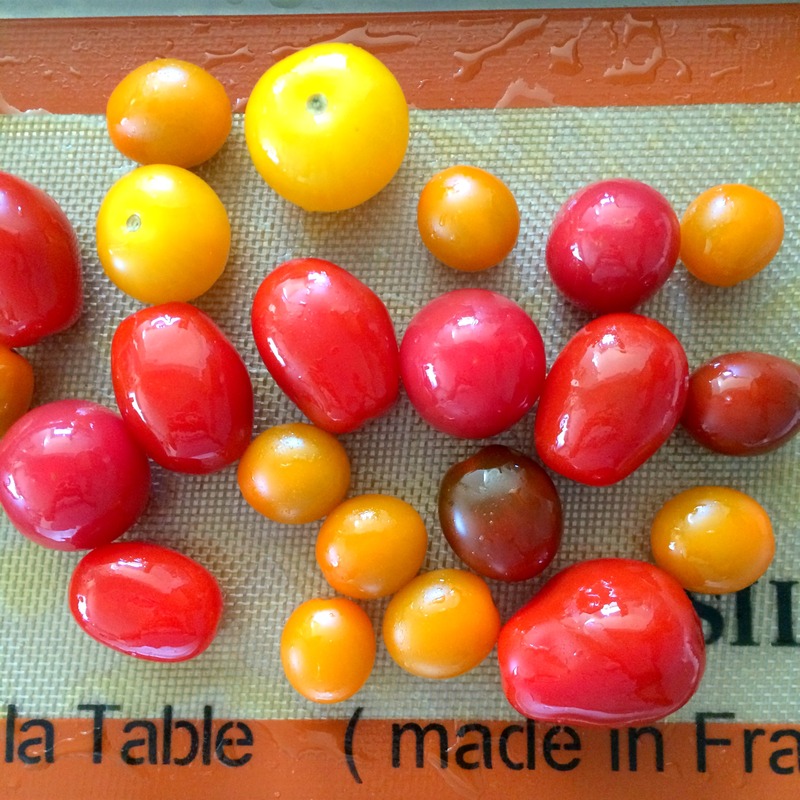 On a sheet pan, toss tomatoes with 1 T. olive oil until tomatoes are lightly coated. Roast in the oven for 25 minutes, tossing once halfway through. Set aside. Preheat broiler. 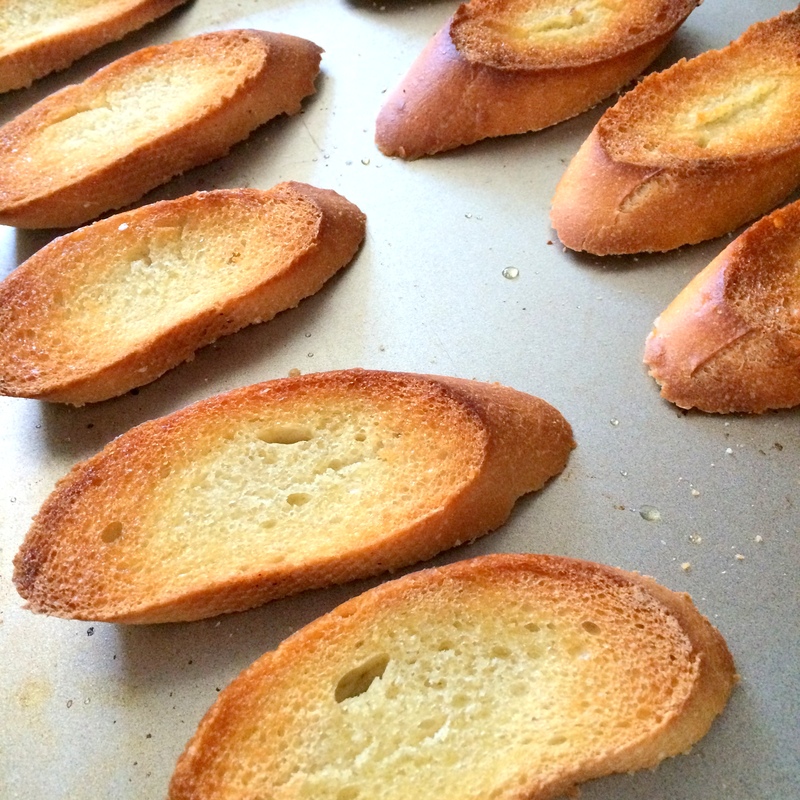 Lay baguette slices on a baking sheet and brush each slice with remaining 1 T. olive oil. Place under the broiler for 5 minutes or until golden brown. Top slice with about 1 tablespoon of ricotta cheese. 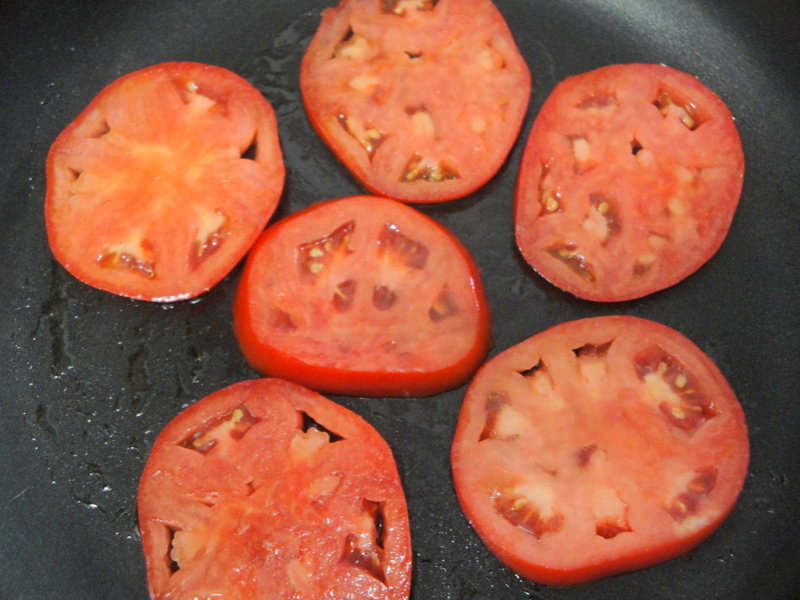 Spread tomatoes evenly across all slices (about 1 or 2 tomatoes on each, depending on size). Top each piece with a basil leaf. Sprinkle with salt and pepper, to taste. Once again, I’ve been missing. I’ve been home for two weeks over the last two months so I really haven’t been able to cook much, hence not really able to post. Last week, I was away for work and while I was gone, my power went out for two days due to a storm. While I was kind of happy to not be suffering through 90 degree weather without air conditioning, I wasn’t happy about having to toss out everything in my fridge, including tons of frozen chicken breasts, a whole carton of eggs, an unopened bottle of coffee creamer and a whole box of turkey burgers. Not a good feeling. 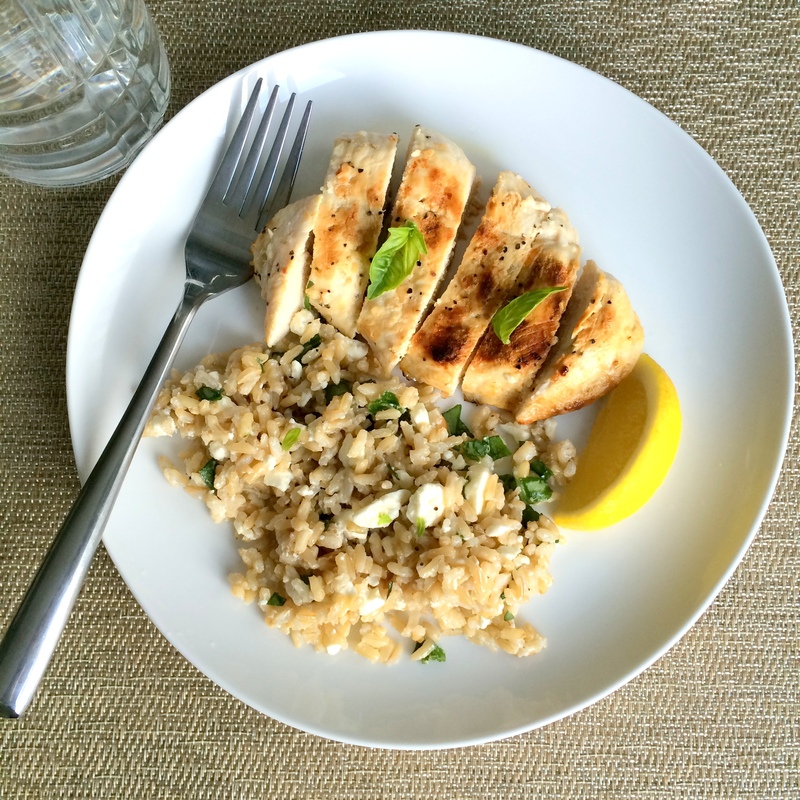 I wasn’t in the mood to cook this weekend so I decided to bring you a dish I made before I headed out of town: Grilled Lemon Chicken with Feta Rice. Chicken breasts are marinated quickly in a little lemon juice, oil and garlic before being grilled until perfectly cooked. 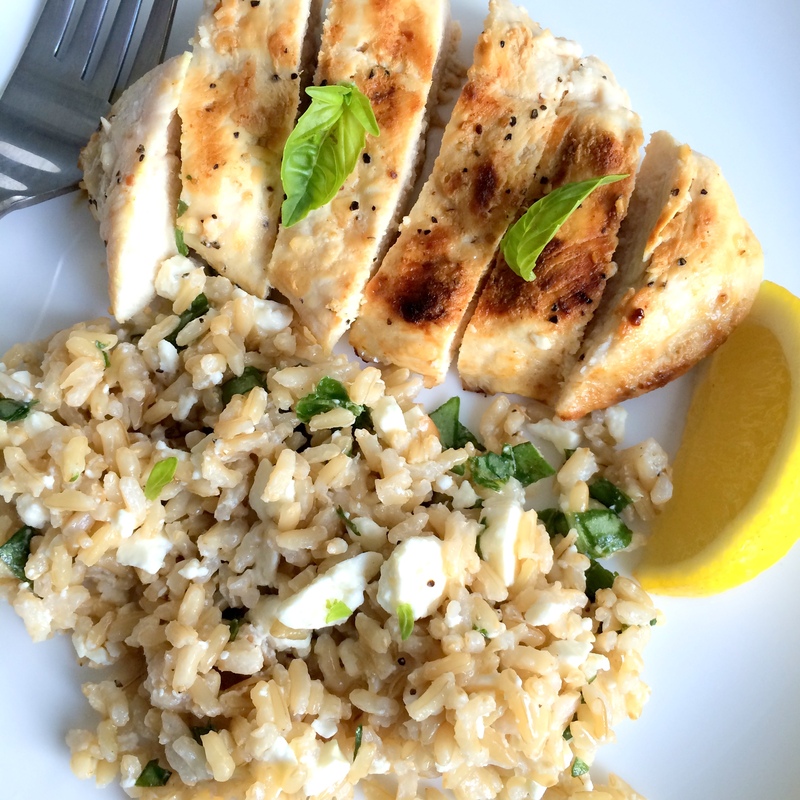 A quick side of precooked brown rice, lemon juice, oil, feta, and basil is the perfect bite to accompany this chicken. I have to tell you, this was one of the best things I have made in a long time. And I make a lot of really good food. There was just something about this. Not just the amazing flavor but also the incredible ease. Take about a perfect summer dinner. Make it! 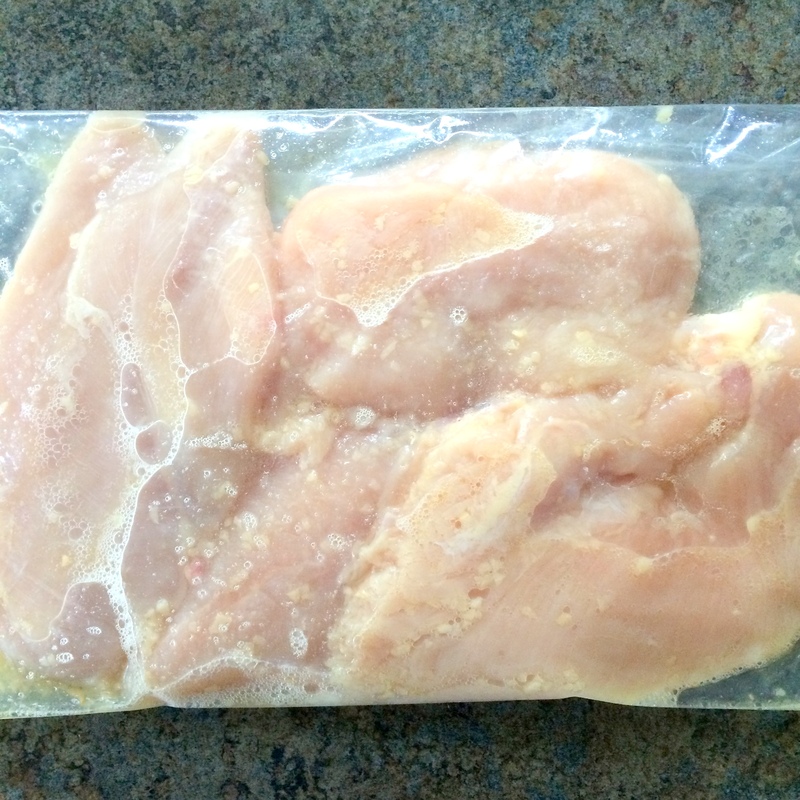 Combine chicken, 2 tablespoons lemon juice, 1 teaspoon oil, and garlic in a zip-top bag; turn to coat. Let stand 5 minutes. Heat a grill pan over medium-high heat. Coat pan with cooking spray. 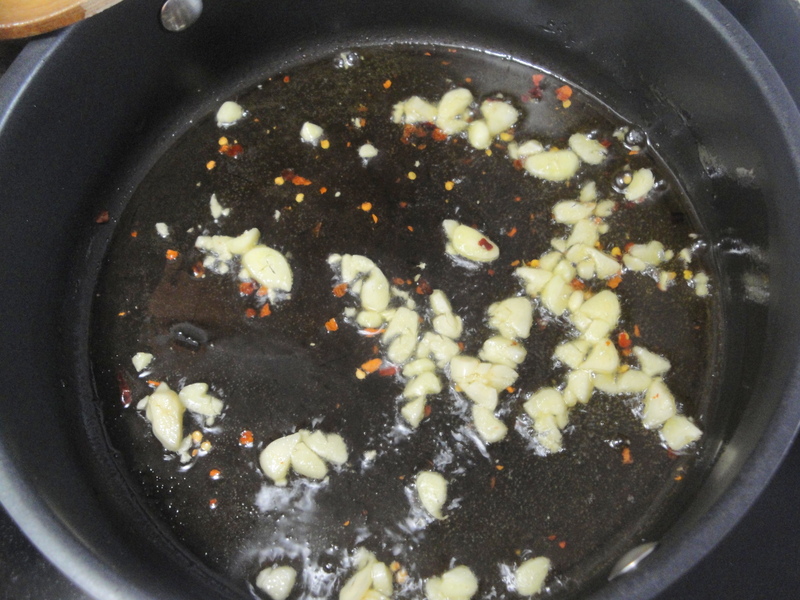 Remove chicken from marinade, and discard marinade. 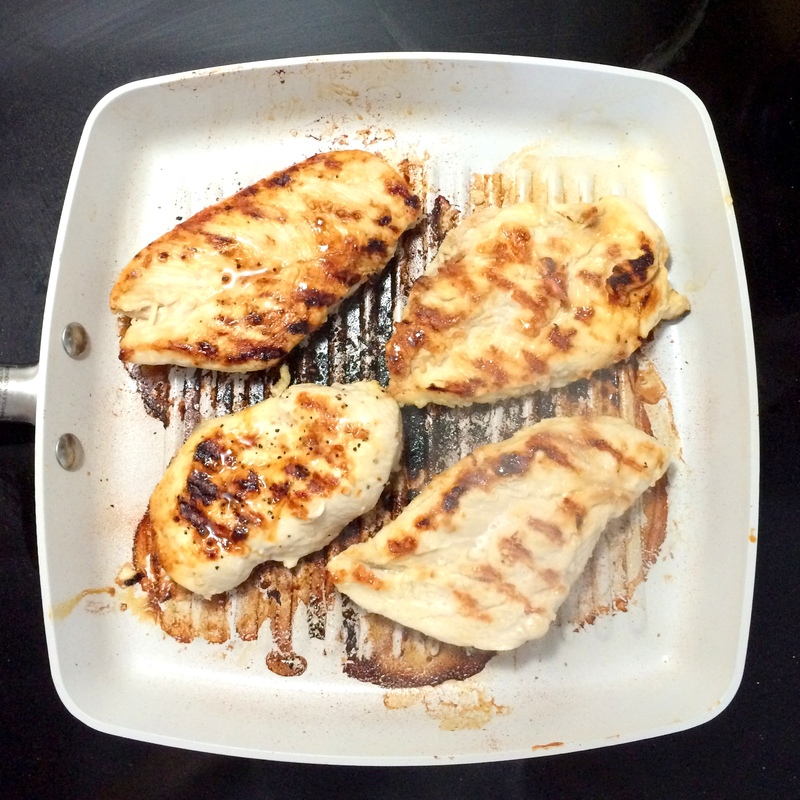 Sprinkle chicken with 1/4 teaspoon salt and 1/4 teaspoon black pepper; grill 6 minutes on each side. While chicken cooks, heat rice according to package directions. Combine remaining 2 tablespoons lemon juice and remaining 2 teaspoons oil in a bowl, stirring with a whisk. 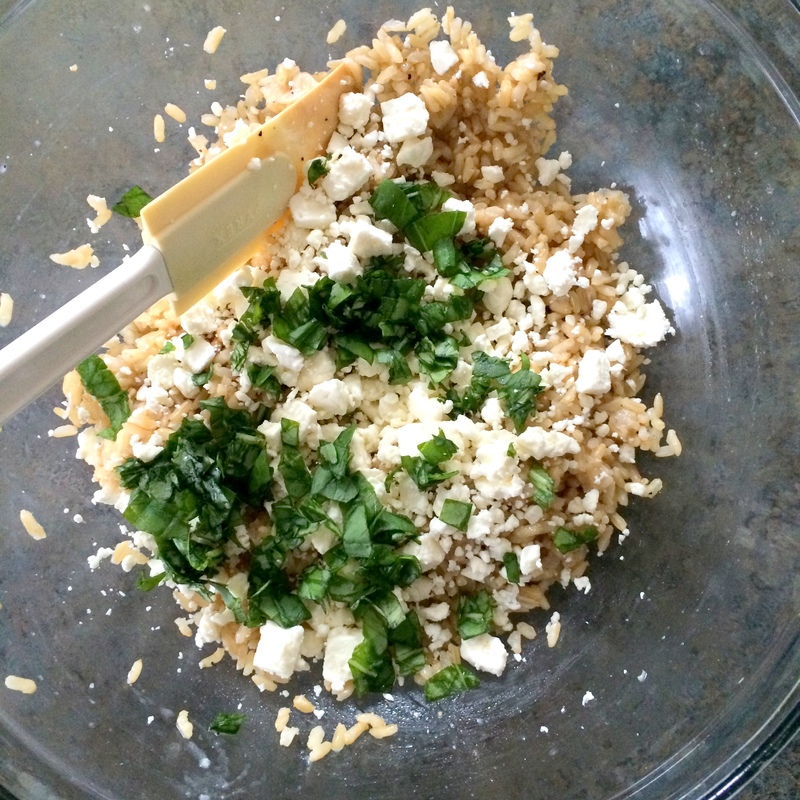 Add rice, remaining 1/4 teaspoon salt, remaining 1/4 teaspoon pepper, feta, and basil; toss. Yes, I know, caprese tends to be a little more July than December. After all, tomatoes are a little redder, a little plumper, and a little juicier in the summer. But if I only ate caprese during warm months, I think I’d die. Okay, so I’m dramatic. But I could easily eat it in some way every single day. Even if the tomatoes aren’t in season, caprese can still be good because fresh mozzarella and basil are always available. 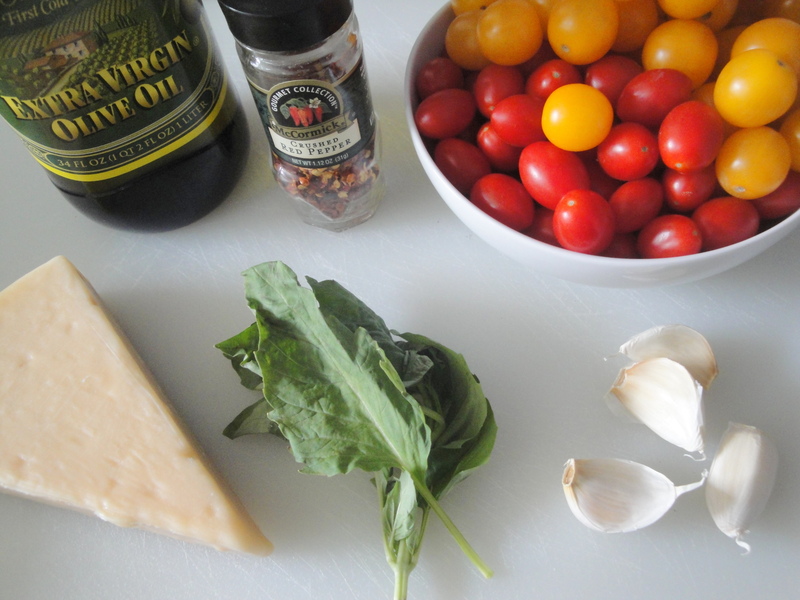 And if you add a little bit of balsamic vinegar or pesto, it can help you forget that tomatoes aren’t at their best. I needed a caprese fix now so that’s why I made these Caprese Sliders. 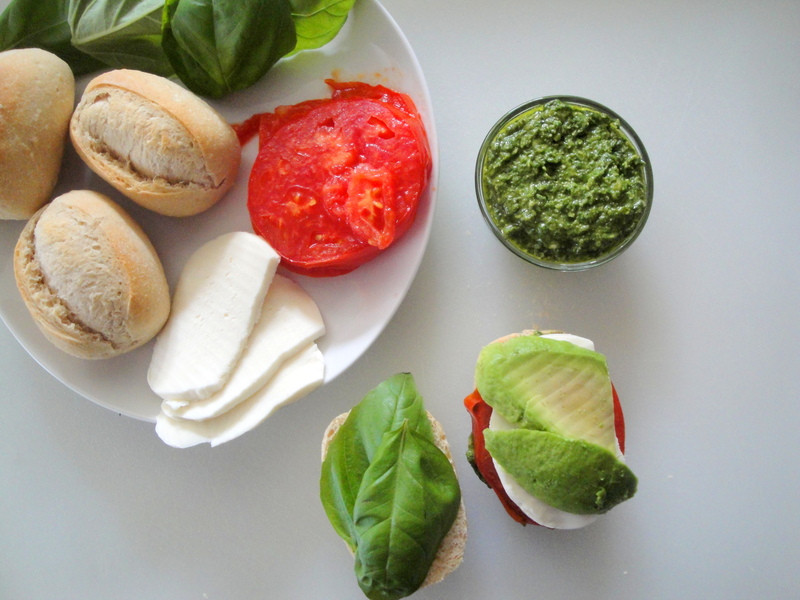 Slices of tomato are grilled on the stove (although I didn’t actually grill them) before being layered with avocado, basil, and fresh mozzarella onto warm, doughy rolls smeared with vibrant bold pesto. Really, you don’t need to grill or warm the tomatoes but if the tomatoes aren’t so great, what’s it hurt? In season, I would stick to raw tomatoes but since it’s not, warming them actually makes them a little juicier so I didn’t mind. These sandwiches didn’t stand a chance with me. So what if they fell apart a little bit? Scooping up pieces of a really good sandwich and having juices dripping down your wrists is a sign of a good sandwich. And this is a really good sandwich! Heat oven to 400 degrees . 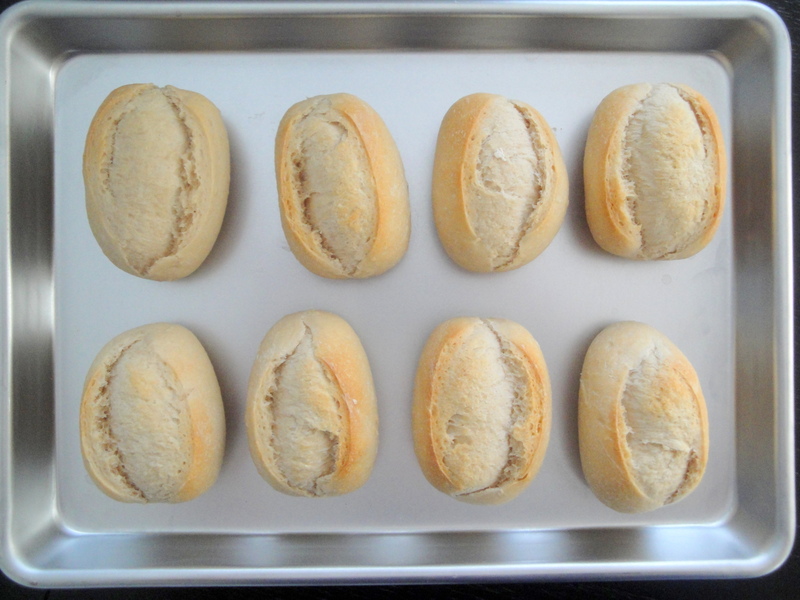 Place rolls on a baking sheet and bake 10 to 12 minutes, following package directions. Allow to cool. Heat stovetop grill to medium-high. Brush tomato slices with olive oil and grill 2 minutes. Turn and grill 1 additional minute. Split rolls horizontally and spread bottom half of each with 1 tsp pesto. 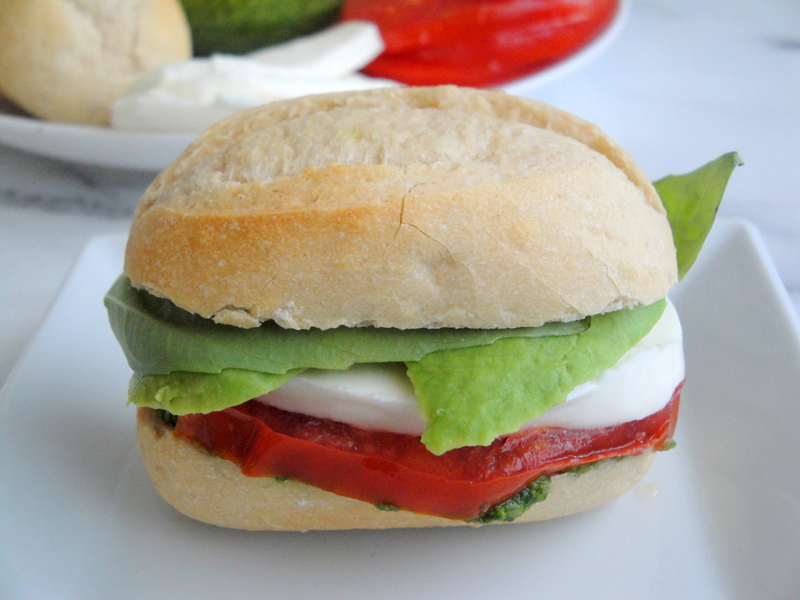 Layer each with 1 tomato slice, 2 basil leaves, 1 mozzarella slice and 2 avocado slices. Top with remaining roll halves. My 4th of July plans are pretty low key this year and I plan on curling up with a good book, a turkey burger and a cocktail. But so many people will be heading to the beach, the lake, the park, the pool or a friend’s house for fireworks and that means needing food. Maybe you’ll be having a burger like me or something else grilled. Maybe you’ll take this holiday weekend to consume as much ice cream as you can. Or maybe it’s the time to eat salads and I don’t mean the leafy green kind. I mean the potato-y, mayonnaise-y, pasta-y kind. 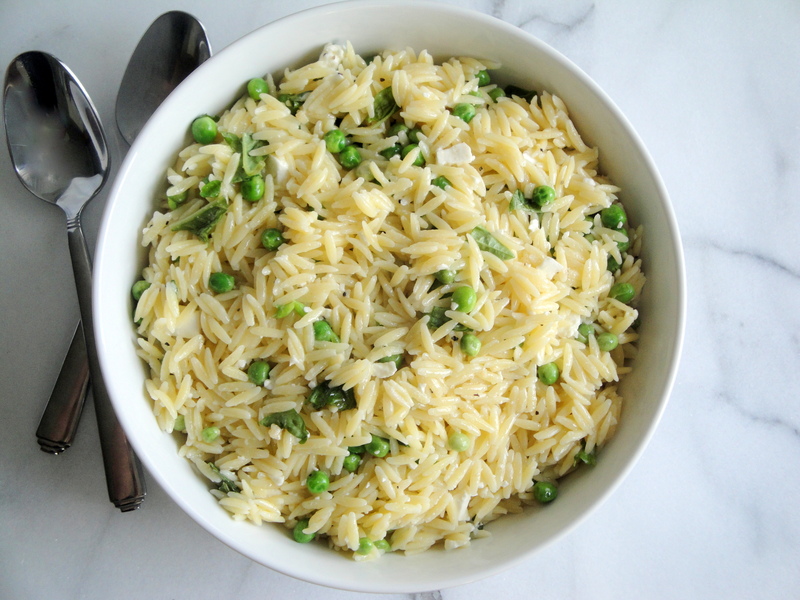 This Orzo Salad has been a long time staple of mine which is my go-to dish whenever there is a potluck at work, a picnic or any impromptu get-together. 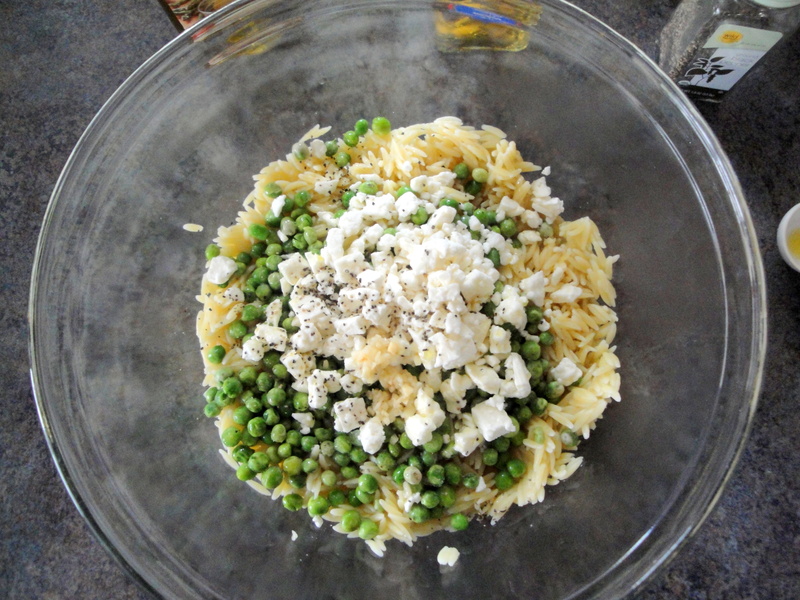 Quick-cooking orzo, frozen peas, and feta cheese are mixed together with balsamic vinegar, olive oil, herbs, salt and pepper. That’s it. This pasta salad is so fast to make and easy to throw together at the last minute. This salad doesn’t have a lot of ingredients so the vinegar comes through nicely without being too overpowering and the peas add a subtle sweetness which pairs so well with the pasta. I used basil instead of parsley because I had it on hand but any herb would work here. The herbs provide a bold freshness which only complements this pasta. 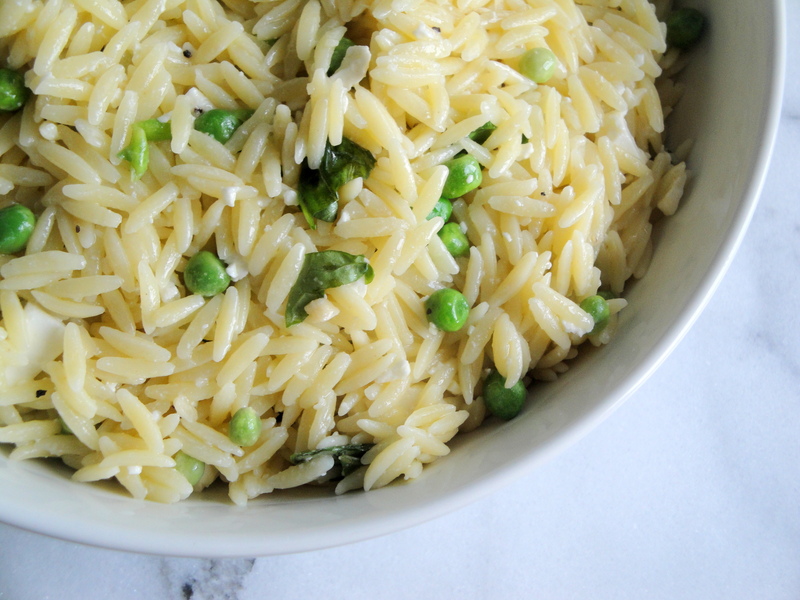 Orzo cooks in about nine minutes so if you have a box on hand, this is something that you can pull together quickly. Give this a try anytime you need a quick side whether it’s a holiday weekend or not. I bet it’ll become your go-to recipe too. If you like this, also check out Orzo Salad with Corn, Tomatoes, and Basil. Combine all the ingredients in a large bowl, and toss well to coat. Cover bowl and chill for 1 hour. I’m a real sucker for pesto but it’s one of those sauces that I don’t like to buy (I think it’s better when it’s fresh) yet I never make it at home, even when I have a bunch of basil. 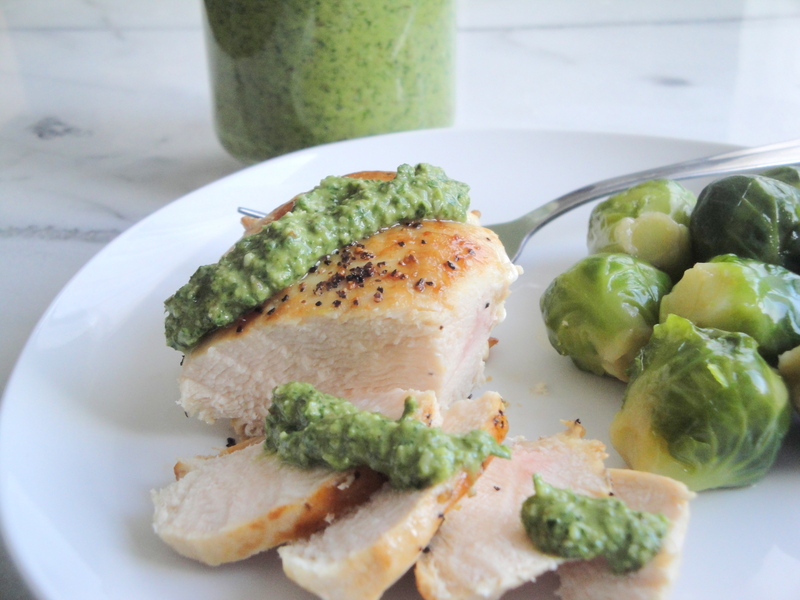 Pesto is so full of flavor and so easy to make that it’s just silly that I don’t make it more. It’s good on any meat, pasta, veggie, pizza, sandwich or even eggs. 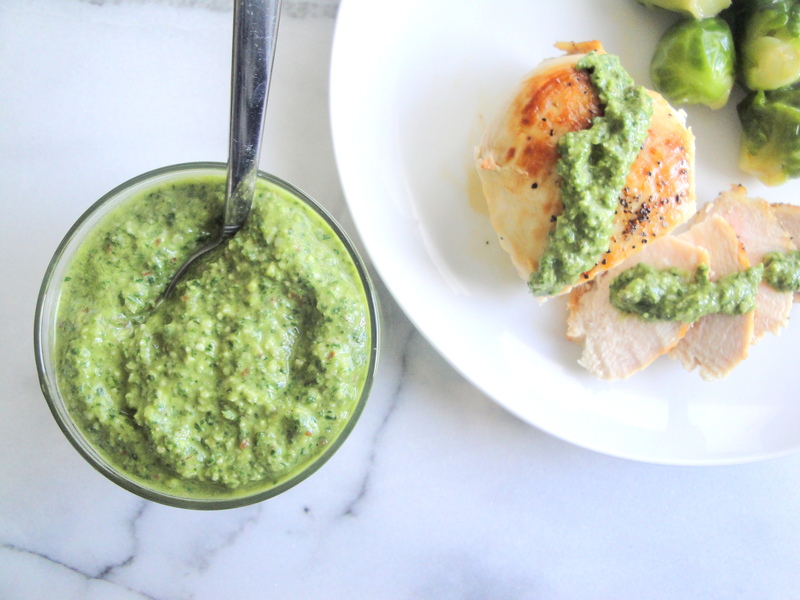 When I came across this recipe for Green Pesto Sauce, I wasn’t sure what to think since it’s made with fruit juice but one day at the store, I found myself looking at bottles of Naked juice and decided to give this pesto a try. 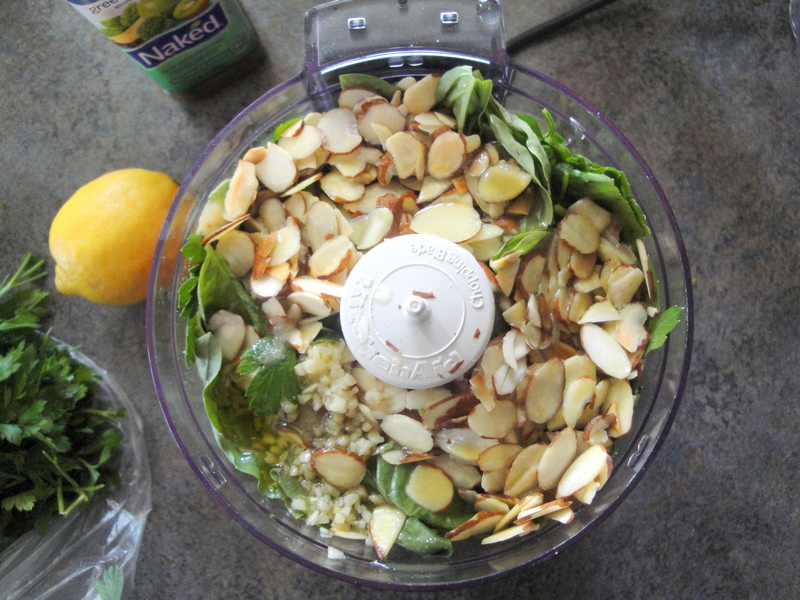 Basic pesto ingredients of basil, parmesan cheese, olive oil, garlic, and nuts (I used sliced almonds because I had them on hand) are combined with parsley, green fruit juice and lemon juice which add other layers of flavor. This isn’t your basic pesto so the hint of sweetness from the fruit juice may not be your cup of tea. And while I prefer regular pesto, I was pretty surprised with the interesting and unique flavor of this. 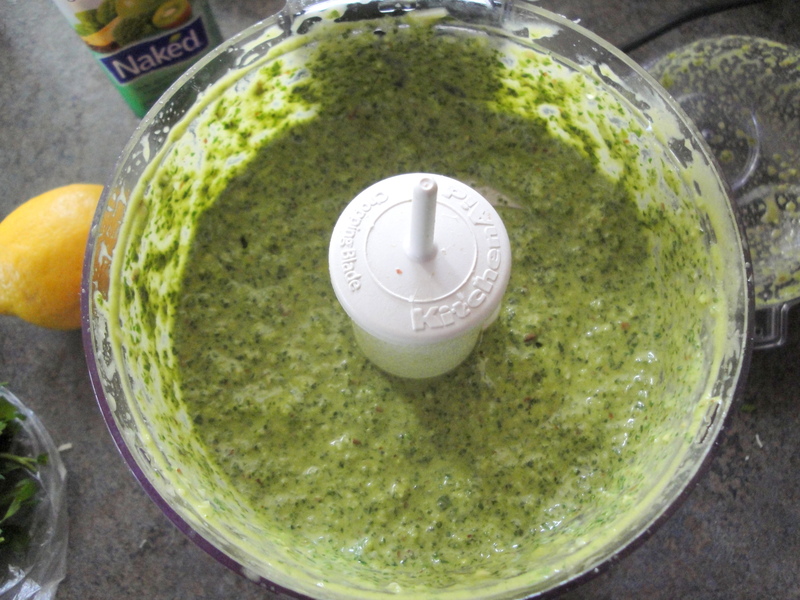 In a food processor or blender combine all ingredients. Cover and process or blend until almost smooth. Serve at once atop steamed or roasted potatoes or vegetables or cover and chill up to 2 days. Stir in additional juice to desired consistency. Sorry if I’ve been a little obsessed with appetizers lately. They are just so easy to make and most of the time they are much easier to keep portion controlled than a bigger meal. 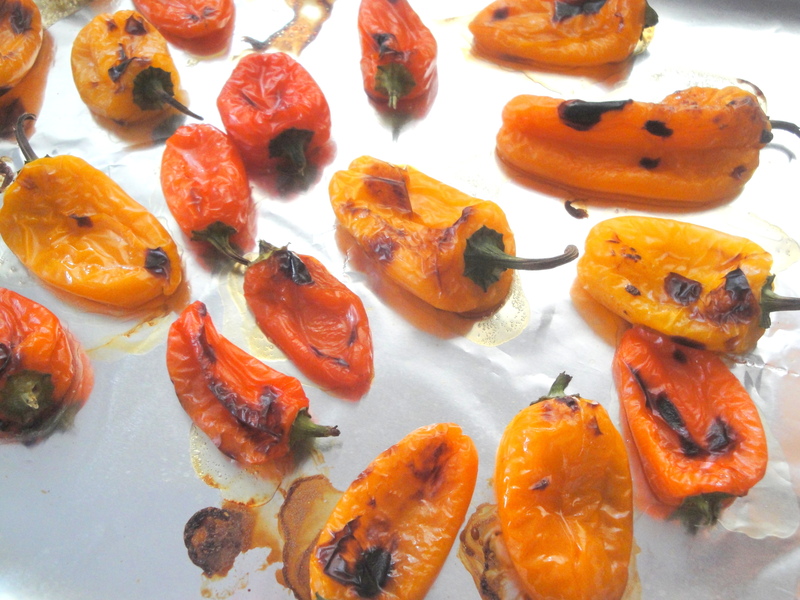 But when I first used mini bell peppers for this appetizer a while ago, I’ve kind of been looking for another recipe for them. And when I saw them on sale at my grocery store this weekend, I grabbed them without a second thought. 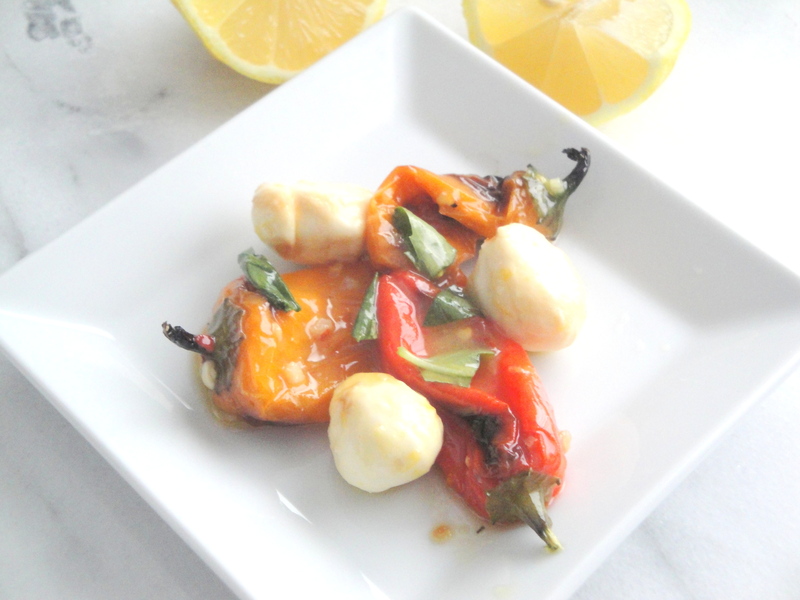 I’m not really sure how I came across this recipe for Marinated Peppers and Mozzarella (on page 6 of the booklet) but I’m sure glad I did. Mini bell peppers are broiled until blackened and soft and then mixed with olive oil, garlic, lemon rind and red pepper flakes. 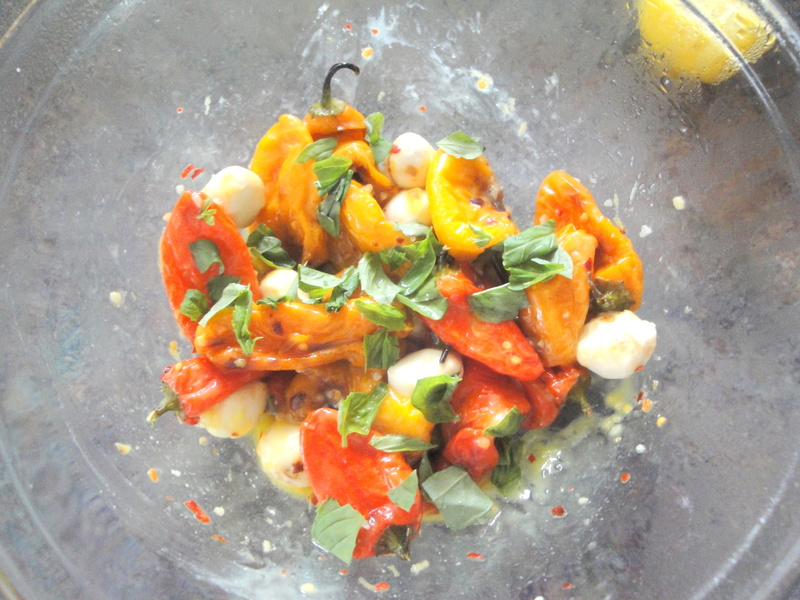 After marinating in the refrigerator overnight, lemon juice and fresh basil are added, livening up these low-carb peppers which are RIDICULOUS. 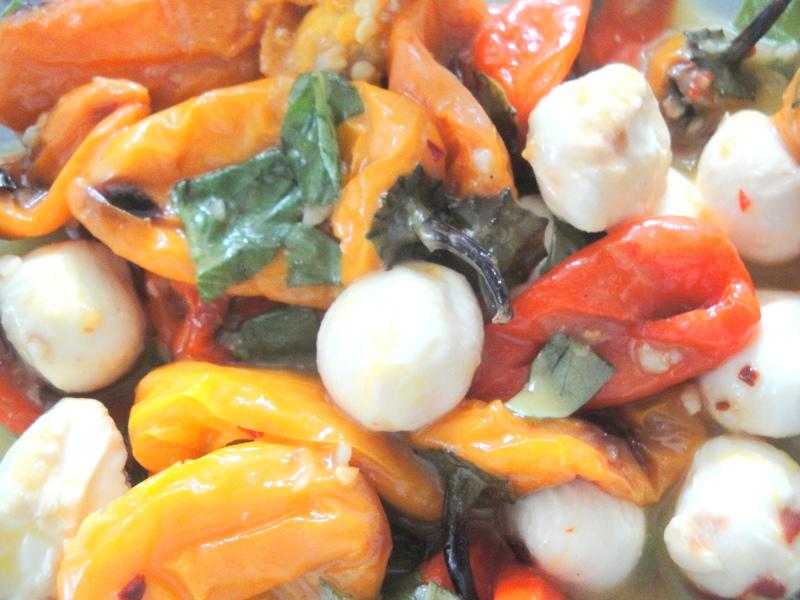 The peppers are perfectly soft, sweet, and mellow, the mozzarella is creamy and rich, the red pepper flakes are mildly spicy, the lemon is bright and the basil is perfectly aromatic. I used half the amount of olive oil indicated in the recipe and still think I could have used less so use your judgment. These are fantastic just the way they are but would also be great served on some baguette slices or even with the peppers cut up in some pasta. Mini bell peppers, I’m officially in love with you. Preheat broiler to high. Arrange sweet peppers in a single layer on a foil-lined jelly-roll pan; broil peppers 4 minutes on each side or until blackened and tender. Cool. 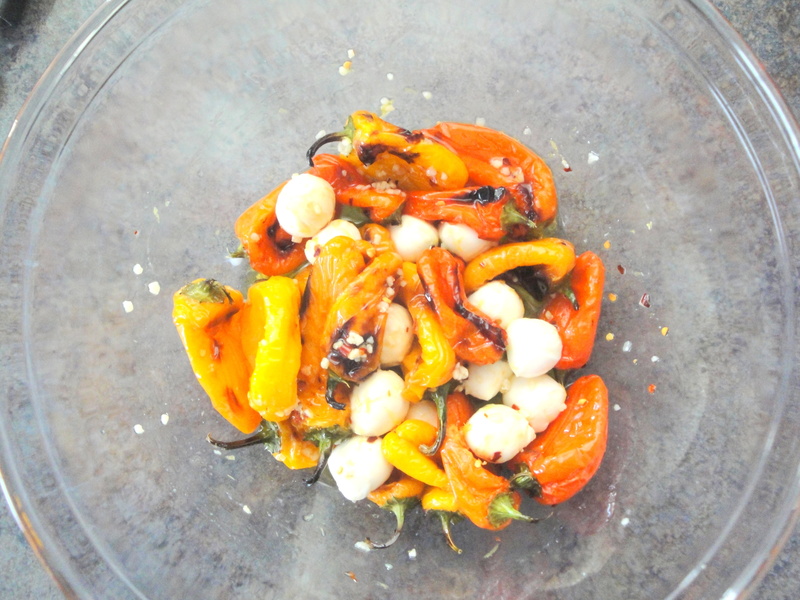 Combine peppers, olive oil, garlic, lemon rind, crushed red pepper, salt, and mozzarella balls; toss. Cover and refrigerate overnight, tossing occasionally. Let stand at room temperature for 30 minutes. Stir in basil leaves and lemon juice before serving. I have to be honest. I’ve been trying to watch my carbs lately. It’s a pattern with me. I get mad at myself so I torture myself by watching my carbs and end up getting mad at myself even more. 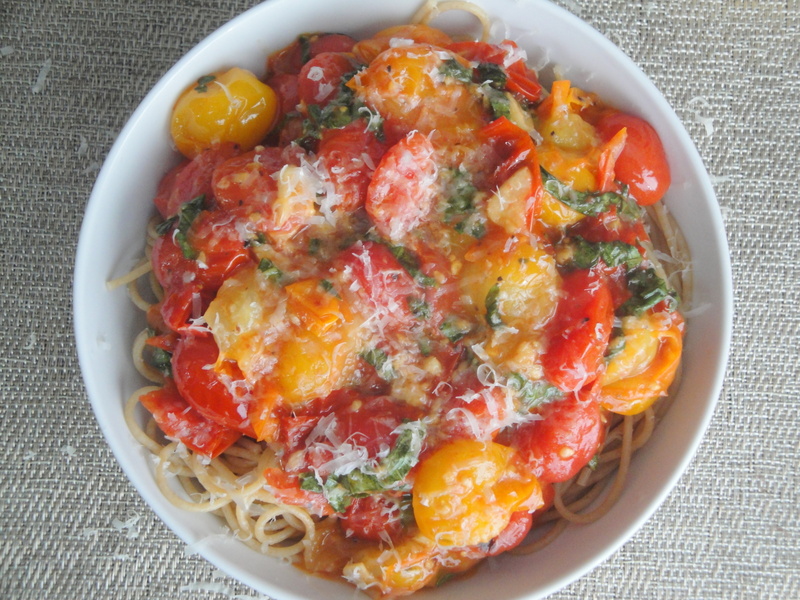 So, straight up I’ll tell you that I made this recipe for Easy Cherry Tomato Pasta Sauce a while ago. I wish I could say I made it recently but sadly, no. Would I give my left arm for some of this now WITH the pasta underneath it? Probably. 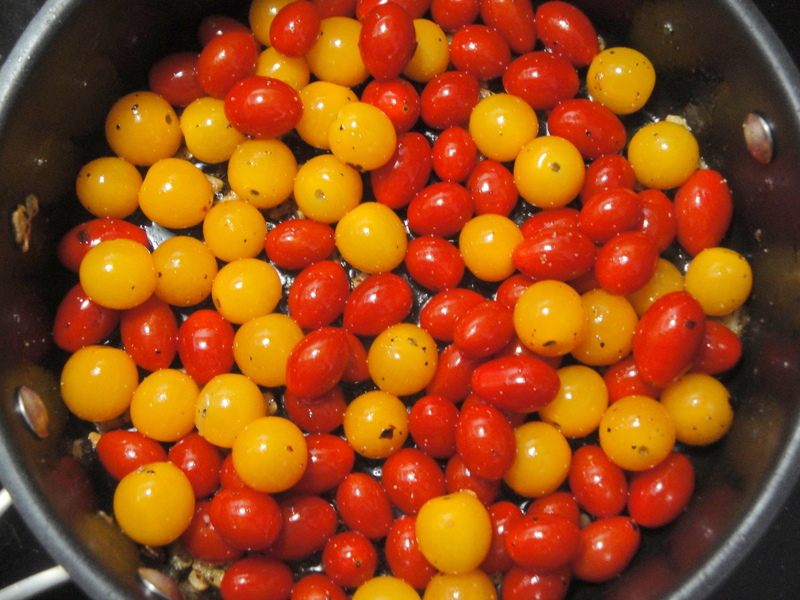 Cherry or grape tomatoes are added to olive oil, garlic and red pepper flake and heated until they open up and become juicy (if they don’t open on their own, use a wooden spoon and get some delight in popping them open against the side of the pan – it’s kind of like popping bubble wrap). 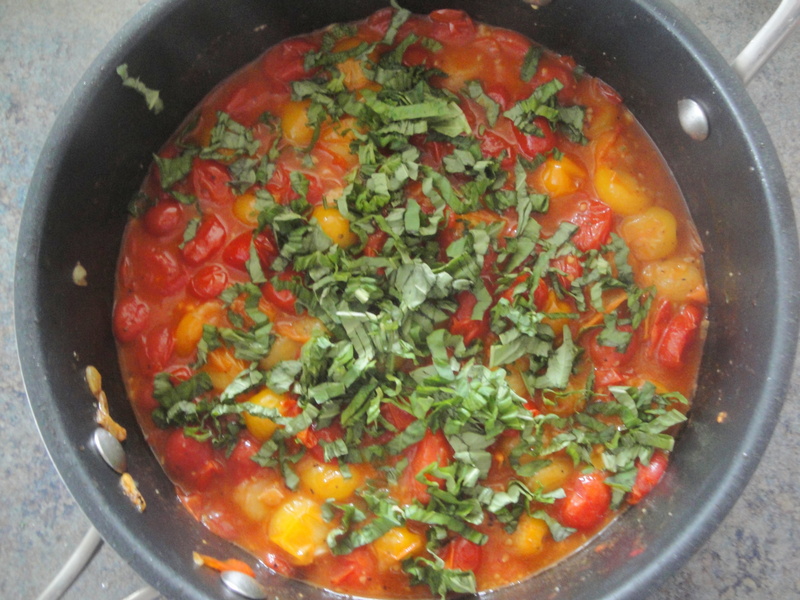 Once heated through and the juices flow, remove from the heat and add fresh basil. Literally, that is it. When the title of this recipe says “Easy”, it means it. And not only is this easy to make but it truly is so fresh tasting that my first bite made me think of what fresh restaurant pasta sauce tastes like. The only thing I have to say is that I used A LOT less olive oil that it called for. I used 1/4 cup (as opposed to 1/2 cup) and my sauce was plenty oily. Next time, I’ll use even less. So use your own judgment when it comes to the oil. 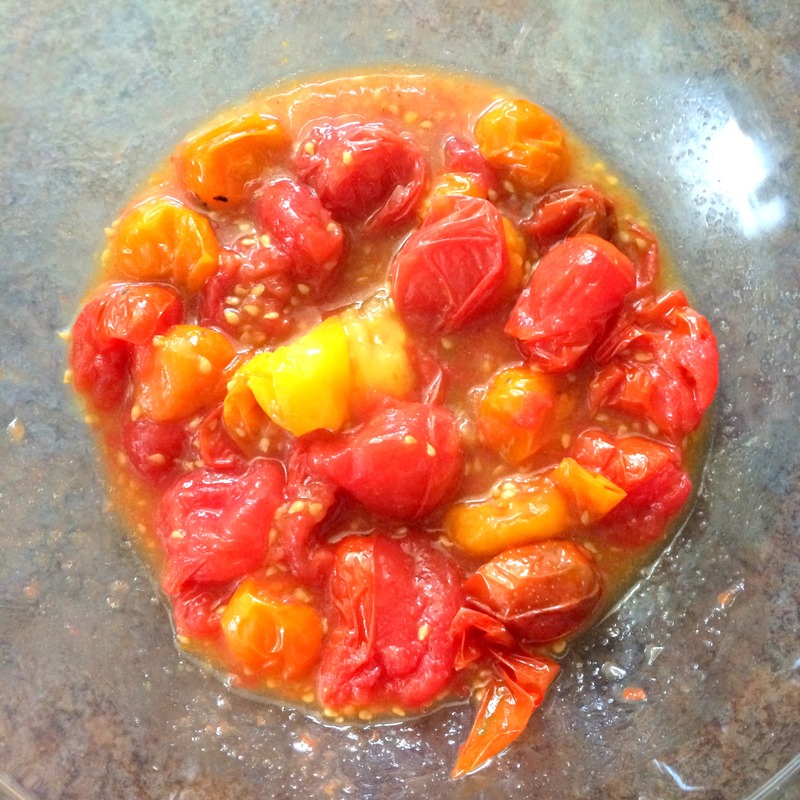 You want the tomatoes to be the star and trust me, if I stick to this low-carb thing much longer, I’m not too proud to make this sauce and just eat it with a spoon. Seriously. Heat oil in a large skillet over medium heat. Add garlic and red pepper; cook, stirring constantly, 1 to 2 minutes. Remove from heat; stir in basil. Divide pasta among serving bowls; top with tomato sauce, cheese, pine nuts, and additional black pepper, if desired.